Damiana Sage Miller receives messages from ascended masters, angels, archangels, and other beings of Light, sharing their messages of love and hope. 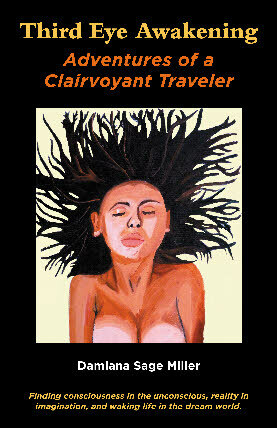 She is also the author of Ambassadors Between Worlds, Intergalactic Gateway to a New Earth. Bookstores: Order from Ingram, Baker & Taylor, Midpoint Trade Books, or call 505-983-1856 for Bulk Discounts. Travel with Damiana to a private retreat hosted by great spiritual masters. Visit ancient Atlantis. Enter forbidden worlds where souls go after death. Meet the dream weavers, who influence cosmic energy and plant seeds in dreams. Exchange energy with fairies and sprites who exist in other dimensions. Relax on the infinite strands of the universe, where love and light can be experienced and felt. Listen to Isis giving a speech beneath an Egyptian pyramid. Journey inside a black hole. Imagine a forest where owls sing beautiful songs that create images of nature. Take a tour of an advanced extraterrestrial civilization (and meditate with enlightened Pleiadians on their own planet). See the homes they live in, the theaters they perform in, and the floating cities where they keep their technology off-planet. The third eye is associated with the pineal gland in the center of the brain. It is also linked to the brow chakra above the nose. When the third eye is awakened, it is possible to have visions, clairvoyance, prophetic knowledge, profound spiritual experiences, and out-of-body adventures (astral travel). and travel to other worlds. I’m on my grid overseeing the universe. I can throw vibrations out into different areas. I can draw the Earth in and send positive vibrations to it. Some people feel them, others are too busy with their daily lives; they don’t notice them. I can bring in other planets too and do the same. I can jet across the universe. I’m ethereal. I don’t really have a body. I can create light, sound, movement, vibration, color, matter, energy. I can create my own planet if I want to, but mostly I like to send positive energy toward planets. It ripples and gathers on the planet, but some of it just keeps going out into the universe forever. I work with everyone. I recognize the universal connection that I have, and I have everyone’s energy with me. I manipulate the negative energy back into positive energy. I take it in like a tree. I take in the bad energy and emit positive energy. I’m connected with the plants. I’m connected with the extraterrestrials, humanity, animals, down to the smallest microorganism. I’m connected to star clusters, star planets, Light beings, gas beings, vapor beings, to all types of beings in different dimensions and different worlds. Some of them developed negative ways and some of them are more enlightened. They all share my energy.